Deve Gowda is yet to announce from where he will be contesting, while Prajwal will be contesting against BJP candidate A Manju. Janata Dal-Secular (JD-S) president HD Deve Gowda’s grandson Prajwal Revanna on Friday filed his nomination to contest the Lok Sabha election from Hassan in Karnataka. 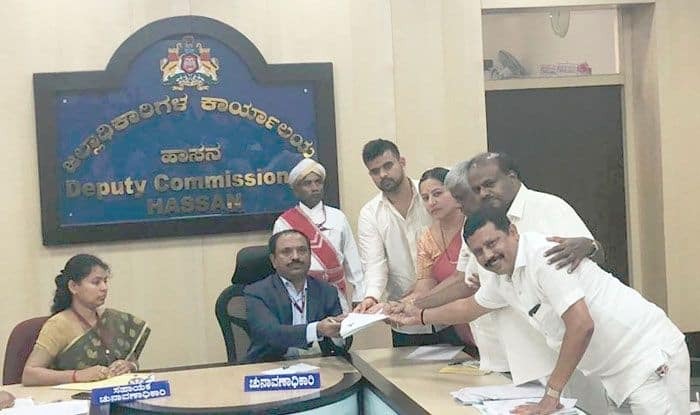 Accompanied by his father HD Revanna, the state’s Public Works Department Minister and uncle Chief Minister HD Kumaraswamy, Prajwal filed his nomination at the Deputy Commissioner’s office in Hassan, about 180 km west of Bengaluru. Prajwal, 28, will be contesting against BJP candidate A Manju, a former Congress leader. Gowda, who hails from Holenarasipura in this district, is a six-time Lok Sabha member from the constituency. He first got elected in 1991. He is yet to announce from where he will be contesting.